Looking for a new drafting table for your office/study? Our adjustable drafting table is definitely what you want. This stylish drafting table is constructed with premium steel frame and toughened glass desktop. Adjustable desktop angle can be easily adjusted from 0 to 60°to meet your needs and drawing habits. Protective filleted edges and rounded corners can avoid undesired injury or damage. Two layers of non-woven cloth drawers and the stationery trays provide ample storage space for your stationery and drawing tools. 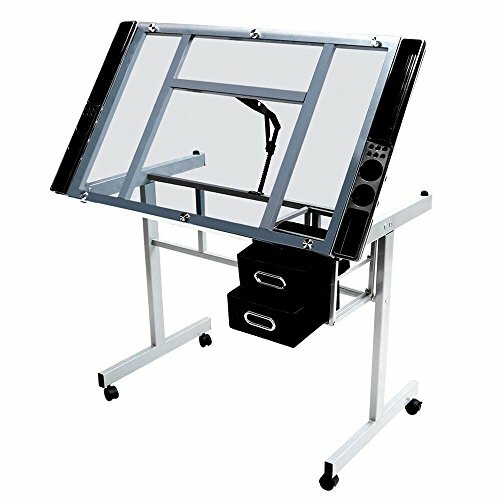 This rolling drawing station can be used as a light table, drawing table, computer table or writing table.